Not been too active in the chess-o-sphere, with a pathetic cold lingering on and spoiling life in general ! However, the subject of this post relates to this where I commented on being censored for my "rudeness" of having 'Handshake' as my end-of-game message. How would we cope in the replay ? Would we shake and make up ? Would there be a titantic struggle at the board as neither player gives in ? Complete anti-climax, although I suppose a consistent approach. No reply to game offers in the forum, so I win by forfeit, never the best way, but at least the team gains a point ! In between, I lost my previous T4545 round. No real excuses ( not even the cold ). We both had chances, I made a mistake, but worked my way out of it, then failed to capitalise on my opponent's mistake, overlooked the strong pawn advance and although I clearly remember calculating Rf2, I actually played Rf3, which put me back into difficulty ! 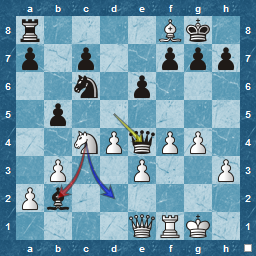 Here I played what I thought was the clever Nd2, threatening the Queen. 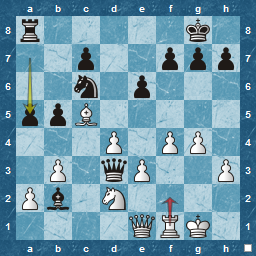 The simple Nxb2 would have been good, with Rxf8, followed by Qd2 or Nd1 and White is fine, if not a with an edge. Nxb2 is better than my Nd2 ?! Although I played on and defended like a trooper, I had to give up Bishop for pawn to prevent a queen promotion. Rook, Knight and pawns vs Rook and pawns is not an easy endgame to lose, and my opponent played it well. 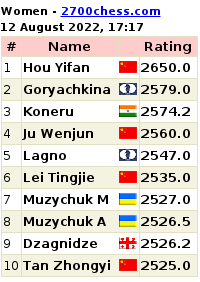 This week I am also in the U1800, as the team there is down its strongest player. I intend to play as best I can, but have no illusions as my opponent is consistently rated around 1800. In local news....the first snow of the Winter arrived last night, and I am not surprised. It was bitterly cold walking home after food and drink at the local bar. Even a fine de Koninck could not keep from me the easterly wind that swept across the harbour ! 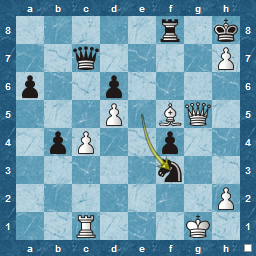 After what can only be described as an interesting game, with some unusual and thought-provoking moves by my opponent, he allows a King/Queen knight fork on move 30, and, quite naturally, resigns. Yes, I have an auto-reply of "Handshake", and this appears to upset him as my initial chat has the answer "I really don't like auto"handshake" wrecks the spirit of the gme YOU ARE CENSORED FOR RUDENESS "
What can I do but be polite in my message to him, despite his shouting at me ! I've heard of OTB chess etiquette incidents with the refusal to shake hands at the start of a game etc, but this is the equivalent of me offering a handshake OTB, and being refused : how would that make you feel ? Well, we will see how the return match goes in a few weeks as it may be difficult to arrange if I am 'censored' ! Looking at his finger notes, I had to smile even more as his attitude did not reflect what he had written ! 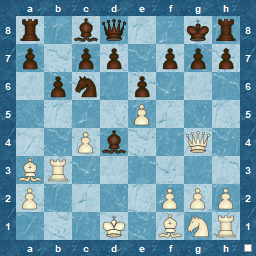 Here's the final position, move 30 from a slightly unusual Philidor...analysis later. 30...Nf3+ ....Eek ! Game over ! A Scotch game : Four Knights variation, I'm White. 1) My opponent made at least 3 consecutive, weak moves with his bishops early in the game, losing time and giving up his dark-squared bishop anyway. 5) I had some good ideas from Nigel Davies and Tony Miles. 6) I'm a Grand Master in disguise.